My first book, and yes I admit it's showing its age. But it's still one of very few books that have tried to tackle this kind of material. It's about trying to find patterns in domain models of businesses, and is based on much of the domain modeling work that I did (and still love doing) in the late 80's and early 90's. The patterns come from various domains, including health care, financial trading, and accounting. 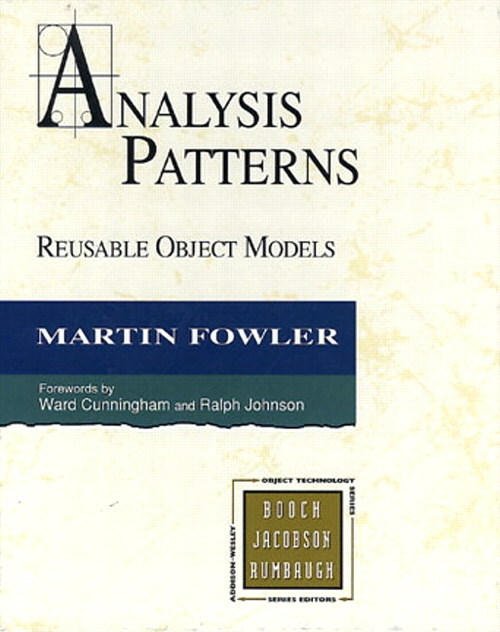 Each of the patterns is described both textually and in a simple pre-UML notation (this book was written before the UML had stabilized into a usable form). There's much I could do to improve the presentation of the patterns in this book with what I've learned since. The core patterns themselves, have stood up surprisingly well to the test of time. There's very little here in the core content that I would change, but there's much I could add and I think I could now make them a lot easier to understand. Articles on this site that talk more about analysis patterns. Several patterns in the book refer to work we did creating the Cosmos Clinical Process Model for the UK National Health Service. This document is not available officially, but there is a page here which has a bunch of pdfs of it.